March Week 3 Friday Showtime: Spring! I don´t know about you, but I have really enjoyed this week´s theme! I love spring for so many reasons, and one of those are because it is the beginning of garden season for us. I love the day when we first plant our first seeds. So much in fact that I had to scrapbook it! I broke out my watercolors for some playtime for this and I love the different kinds of green I created. Using pocket cards for layouts is something I do often. It´s so easy for me to just reach for my container of cards and flip through to find a place to journal etc. How about you, did you make a project with this week´s theme? Document spring (or fall if you are in the southern hemisphere!). So I am here with my response to Monday's challenge. I went looking in my Instagram feed and saw lots and lots of pictures of my puppy. ;) I know this week was about people. But when you spend most of your time home with a pet, they do become a bit human, no? So please forgive my playing wild and free with the challenge. I hope that you will play along! I can't wait to see your layouts! Hello! We hope you are enjoying our month of challenges! Here is our week 2 challenge. Can't wait to see what you do! Here is my #TBT layout. It was fun. Link us up in Instagram. Can't wait to see yours! Hello! This month we are going to have a little bit of fun with challenges. Hope you will play along! This week, let's find one of those #TBT photos and scrapbook it! Are you in? Welcome back! Yesterday I shared a layout I made about myself (oh hi! I'm Amy!) and encouraged you to make one about YOU. Then I realized: you can’t make layouts about yourself unless you have pictures of yourself. Which brings me to something I feel pretty passionate about, and that is photographers getting in front of the camera. You know: letting someone take a picture of you. And I know: this is really, really hard. Especially for those of us who are used to taking the pictures. It’s hard to ask someone to take your picture, because it makes you feel vulnerable. It’s hard to be the subject of a photo because you can’t control it. And it’s hard to feel like you are enough to be in the picture. But it matters. It matters so much that we get ourselves into our family’s pictures. I learned this—not just in theory, but deep down, bone-deep, soul-deep—when my dad died. I was given the task of putting together a slide show of photographs of him. I had a ton of pictures of my dad—with my kids, with my mom, my sisters, my nephews and nieces. Even my husband. Even the cat. But I had exactly one (one!) picture of me with my dad. And now he’s gone and there’s absolutely nothing I can do about it. Except for making changes moving forward, which is what I’ve done. I thought about the reasons I feel uncomfortable with getting my picture taken and came up with some solutions. So I thought I’d share what I’ve learned with you. Moral of the story: communication helps! Talk to the people who might be willing to take a picture or two of you. Tell them if you feel uncomfortable about it, but also tell them why it’s important to you. Give them some suggestions about good angles. Think about how the light might look and then move yourself if you need to. Most importantly, relax! Remember that person loves you! Find more than one photographer. My daughter, who loves having her picture taken, also loves to get her hands on my camera. She’s taken some awesome pictures of me when I wasn’t even paying attention. My son, who hates having his picture taken more than just about anything (I think he’d rather have his eyelashes yanked out than pose for a picture), will always offer, every time I am taking family pictures, to take a picture of me instead. It’s his way of getting out of having his picture taken…but it’s OK because we both get a little relief from our discomforts! Moral of the story: If someone asks to take your picture, say yes. If your best friend wants to take a selfie with you, take a selfie. If your mother gets out her camera, smile back! Also, if someone else takes a picture with your camera, it will be ok. Put the neck strap right over their head before handing it over, tell them to be careful, and then smile. Make it a tradition. When I was trying to figure out how to get myself in more pictures, I realized that every once in a while, I’ve had someone take a picture of me with my child on his or her birthday. (I was there for the birth! So their birthdays are important to me not just because of their existence and their celebration, but because I loved the day they were born, and on their birthdays I remember it fondly.) This realization helped me create two traditions: Now, I have someone take a picture of me with the birthday kid on every single birthday. It’s become another part of our birthday celebrations, as inherent to the party as cake and candles. The second tradition is that either on my birthday or on Mother’s Day (my birthday is in April, so they’re close), whichever works out best, I have someone take a picture of me with all of my kids. These have become some of my most cherished images. Moral of the story: when you create some photo traditions, it feels less & less awkward to ask for the picture, because it’s just what always happens. Do it long enough and you won’t even have to ask anymore; they’ll just know to do it. Take advantage of group shots. It’s infinitely easier to be in a picture if there’s someone else in the frame with you. So when you do something—anything, really, where someone takes a picture, which these days is nearly every situation we can imagine—get in the group shot. Let someone else, a total stranger, take the picture so you don’t have to. (I’ve asked people on the top of mountains, in the Coliseum at Rome, at races, on the beach, and of course at restaurants to take a group picture for me.) When you go on vacations, get in the shot in front of the museum or historical monument or beautiful mountain or stunning lake. Family party? Get in the picture. A hike, a family trip to the bowling alley, a day at Disneyland? Get in the group shot. Moral of the story: If you take all of the pictures of an event or experience, there isn’t any visual proof that you were actually there, too. Your memories and stories matter just as much as everyone else’s. I understand her wanting to look her best. But now that she’s gone, it wouldn’t matter. If I had a photo of her with my husband, and she still looked a little bit pale from her surgery, and her hair wasn’t perfect? I would still cherish it. So here’s where I’m going to get a little bit harsh with you. Right now: look at yourself in a mirror. See that face? That body? That is you. That is what people love and are grateful to have in their lives. So even if you look in the mirror and think “holy ^>=~ *&$*@!~`+=, I’m wrinkled! I’m fat! I need to get my hair colored, when did I get that mole, is that an age spot on my cheekbone? Why do my eyebrows grow back in faster than a 5 o’clock shadow?” (or however your particular complaint(s) about yourself manifest, that’s just my own personal inner dialogue), guess what? The people in your life love you anyway. Strike that—they don’t love you despite your faults. They love you for you, warts and all. (Or age spots. Or moles.) They likely don’t even see the faults that you see, because they love you, the whole package. They love you for you. And here’s something else. I’m in my forties now, so I can tell you this is true: It’s all downhill from here. You will never be less wrinkled than you are right now. You might be skinnier—but you might not! You’re going to age; it happens to the best of us. Think about it: I bet when you were ten (or twenty! Or thirty!) years younger, you still had those same negative thoughts about yourself. But when you look back on that twenty-something version of yourself, wouldn’t you like to have it back? That taut skin, that flat belly, those eyebrows that weren’t kamikaze regrowth demons? In another decade, when you look back on the self you are right now, there will be things you’d like to have back. So celebrate who you are right this very minute. Even with the ______________ (insert whatever you don’t love, double chin, appeared-overnight zit, shadows under your eyes). You are beautiful, someone loves you, you are worth being in the picture. Moral of the story: just do it. Put some make up on, and your favorite necklace. Definitely your favorite lipstick. And then get in a picture or two. And you know what that is, don't you? It's a challenge! No, not even a challenge. It's an assignment. Sometime this week, get yourself into a picture. Before March comes. You could even come back here and let us know how it goes. And just so you know I'm not joking, here's a collage of some photos of myself. (Including the one picture I have with my dad.) (These are all pictures that I both am grateful to have and cringe over. I could point out the flaws...but I'm still glad to have them.) Come on: if I can put a photo of myself in a swimsuit out on the Internets, you can take a picture of yourself. Not even in a swimsuit—wear a sweater if you want! or a parka! Just get in a picture. And after that? Make a layout! About yourself, because it’s important and fun and a great way to use some supplies. Your stories matter. Your images matter. Even if you detest having your photo taken. But that's just me. How do you feel about getting your picture taken? Let me know! Hi everyone! Sue here today to share a summer layout and suggest five scrapping challenges prompted by this page. First, the layout itself. #1. STORY: Make a page about a favorite summer tradition. #2. PHOTOS: Take pictures of your favorite local summer destinations. #3. TITLE & JOURNALING: Design a long title for your layout that also serves as the journaling. #4. COMPOSITION: Create a layout with a vertically blocked design scheme. #5. 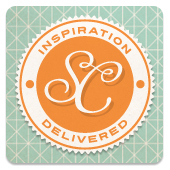 COLOR & PRODUCT: Eliminated patterned paper from your layout and rely on other products to build your color palette. Here's One Final Challenge: Take a layout you've made and pull your own set of five challenges from it. Do this several times and you'll soon have plenty of ideas for all your summer scrapping! Happy Saturday! I am so glad you could join me for our May installment of scrapbook! Saturday. I hope that you have had a lovely month of inspiration. I have enjoyed learning from Christine and Amy and I have found much inspiration from the gallery! I also really loved Amy and Aliza's weekend posts. Happy sigh. So much to love. For today, we are looking into our gallery for color and design inspiration. The sketch this month comes from Cristina's layout. I loved the idea of the pie chart and have been wanting to put it on a layout for a long time. This was just the nudge I needed. Here is how the sketch turned out. If you would like to use the sketch as a layered template, you may download it here. Please let us know if you do! you can see it is lovely in all its soft pastels. Are you excited to try it? Me, too! Here is my layout using the sketch and the colors! Cristina + Jennie = Cristinnie. Thank you, Cristina for the sketch. I really liked using it. And Jennie, your colors are so soft and lovely. Thank you. I had fun using the sketch and colors and hope you will try them, too! And, I hope that you loved the gallery as much as I! As always, if you make a layout using the sketch or the color palette, (or both!) please leave me word and a link. I love to see what you do! What a lovely gallery we had this month! With color as a theme, we couldn't really quite go wrong, could we? With 24 lovely color palettes there was really so much to love. And the layouts were perfect inspiration pieces for our scrapbook challenges. This month, I put a sketch together based upon Kate's layout. and here is the 12x12 adaptation. I thought the collection of photos, title, and journaling blocks were a wonderful foundation for a sketch. I love sketches with more than one photo as I am not so good at that on my own, and this one was so much more than just my regular old grid--I was excited to put it together. I used the new Glitz Finnley line. Love it! Lisa used the sketch to make layout celebrating her garden. Mmm. I wish I lived closer! I love how the tilted photos create such a casual atmosphere on Lisa's layout. Sue's take on the sketch looks so different--it never ceases to amaze me how that happens. Sue has such an eye for mixing patterns, don't you think?? The versatility of this sketch shines brightly when you add Stephanie's sketch layout into the mix.With its whites and greys, you mightn't even recognize it as the same sketch as Lisa and Sue. Love that! I hope you enjoy the sketch this month. If you would like to download a layered template you may do so here (12x12) or here (8.5x11). As always, please leave us a comment with a link if you take a turn with the sketch so that we might see your good works! This month we didn't create a new color palette for you, as we already had 24 to choose from. I did put them all together for you, though, so you could get dizzy from the wonder! Stephanie made use of Jina's lovely palette to create her layout. Mmm. I love this. Having quite a crush on Stephanie's work these days! Those little stars made me think of Saint-Exupery and Le Petit Prince. Don't you think? Sue's layout using the sketch, also used Laura's color palette. Here it is again with the palette below. Isn't it amazing how changing the comparative weights of each color used changes the look so much? I used Christa's palette as a basis for my layout. Is there a color palette that spoke to you? I hope you can right click and save the color palettes and refer to them often. Amy painted a scrap of white card stock with different shades of green paint, then cut the numbers (and some of the title letters) with the Silhouette after the paint had dried. Clever! Please enjoy the cut file! That's it! I am so happy that you stopped by and that we could work on some layouts together. I hope that you feel inspired by our gallery and that you will enjoy the colors, designs, and trends you find there! And don't forget to link your layout when you make one!